Wide area network (WAN)-based approaches to data backup are dramatically influenced by WAN bandwidth limitations and network latency. Without significant, costly WAN bandwidth upgrades this can make WAN-based backup impossible for large remote offices with significant data stores. 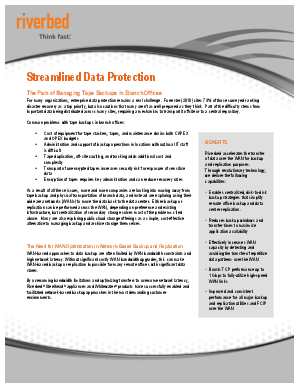 Riverbed makes network-based backup feasible, in many cases through use of existing WAN links, without the need for bandwidth upgrades. Our intelligent, storage-specific optimizations yield higher data reduction ratios for the common enterprise workloads seen in SRDF/A environments at both the network and application level, enabling enterprises to realize up to a 30:1 compression while maintaining a high throughput. Download this paper and learn more about this strategy today.